Abstract: Media readers are solid state devices which enable you to read or write data to and from flash storage media. Media readers are solid state devices which enable you to read or write data to and from flash storage media. In this case, the flash media can include Sony Memory sticks, Compact Flash, SmartMedia, MultiMediaCard and SD Flash. These four types of flash storage media form the basis for countless Digital cameras, PDA's, MP3 players and other devices. If you have a digital camera, you know that it can sometimes be a bit unproductive to go searching for the USB cable and hook up the camera to a notebook, or desktop each time you want to download some pictures. The same goes for really any device which comes with removable flash memory, and this is where the Belkin 8-in-1 USB Media reader comes in really handy. Plug it in once, no drivers necessary, and all your flash memory needs are solved an one location. 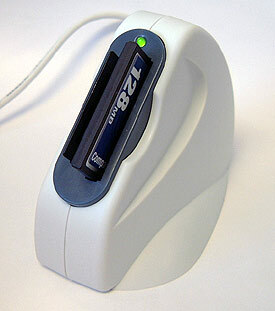 The 8-in-1 Reader/Writer connects to any computer, or USB hub on a USB1.1 spec 12Mbps data transfer rate. The unit draws all power from the USB cable, and if you are running WinXP or Win2000 you shouldn't need to even crack the plastic sealing on the driver CD (it is also MAC compatible). 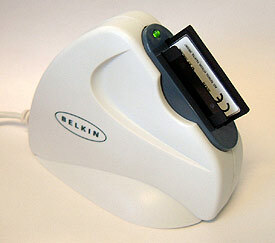 When installed into the computer, the Belkin F5U148 shows up as two new Removable Disks, and effortlessly allows you to manage data as if the flash media in the port was a standard hard drive. For newbies out there who are still a little fuzzy, the Belkin 8-in-1 Media Reader/Writer is a port which allows you to insert your own flash storage media and access the data. The unit does not come with any flash storage media of itself, and does not have the capability to store any information by itself - think of it like a flashmedia 'floppy drive'. The unit itself is quite small, measuring perhaps 10x3x8cm so it doesn't require very much desk space at all. Best of all, while there are plenty of single bay media readers on the market, this little guy does everything in one go (up to two types at once). It really is indispensible if you have an MP3 player or digital camera which uses removable flash media. Technically, the unit only supports four physically different types of flash media, but when you throw in different revisions the following list sprouts up; SmartMedia, Memory Stick, MagicGate Memory Stick, CompactFlash I & II, MultiMediaCard, Secure Digital, IBM Microdrive. We've been using the Belkin flash media reader here in the lab for a few weeks and so far it's been pretty popular. I'd recommend anyone with a group of devices using flash media to consider a flash media reader like this - it just makes life so much easier.